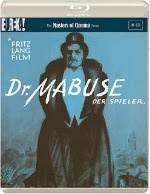 Dr. Mabuse: der spieler is a two-part film from Fritz Lang. The films it total run over 4 hours in length. It’s one of Fritz Lang’s first great films and Lang would continue the story of the criminal masterpiece Dr. Mabuse in The Testament of Dr. Mabuse and The 1000 eyes of Dr. Mabuse, the last film Lang directed. The character of Dr. Mabuse comes from the novel of the same name by Norbert Jacques. Dr. Mabuse (Rudolf Klein-Rogge) is a criminal masterpiece, doctor of psychology and master of disguise. He also has powers of hypnosis and mind control. The good doctor the overseer of counterfeiting and gambling of the Berlin underworld. The first film starts with orchestrating a cunning plan of a theft of an important contract that creates a temporary panic n the stock market that he exploits to his financial advantage. 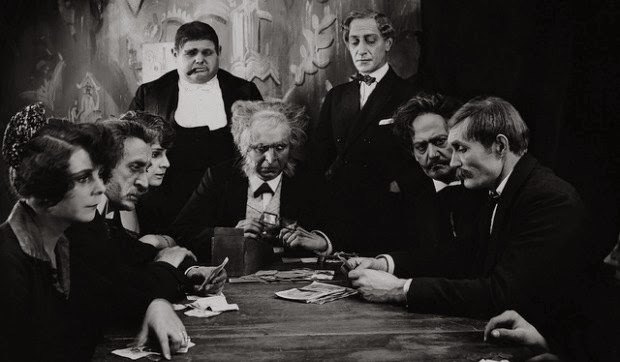 Dr. Mabuse is also a expert gambler due to his hypnotising his opponents. He hypnotises Edgar Hull but after other people confront him about his lost he can’t remember loosing. He goes to State Prosecutor Norbert von Wenk and he believes it’s the same man who is responsible for all of these huge looses in illegal card games. He vows to find the man responsible and bring him to justice. Dr. Mabuse will do anything in his power to stay elusive even if it means murder. The film was preceded by Fritz Lang’s Destiny, which I’ve still never seen but from all accounts was the film, which his style became apparent from. Lang along with Eisenstein and Griffith are hands down the people responsible for all the techniques in modern film language. Lang invented what would become the modern thriller and science fiction film in films like Mabuse, M, Spione and of course Metropolis. He was one of the first directors to use special effects extensively and many modern techniques from him then for example Méliès. 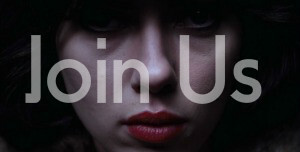 The film is sprawling complicated mystery of intrigue, magic, hypnosis and cocaine. It’s runs for an epic 4 hours and 30 minutes or so and it would be a lie if it didn’t drag at moments but silent films of this ilk were very much the original mini-series. It predates film noir by roughly 20 years and Lang and German expressionism in wider sense were the biggest inspired for the film noir of the 1940s and 1950s. The influence was so much so that Lang himself is also a noted director noir with films like The Big Heat and Beyond a Reasonable Doubt. It’s a one of Lang’s most important film even though it probably could have lost a good hour of footage but if you take it as a proto mini-series you will be fine. The sequel The Testament of Dr. Mabuse is a tighter film and better for it but it all started here and it’s mighty fine piece of work. The great Soviet filmmaker Sergei Eisenstein actually edited it down for a Soviet audience and that would be an interesting find but I doubt it will ever surface sadly. It's easy to call yourself a film fan or even a cinephile but when you dig a little deeper to find out why they call themselves fans its then you truly find out how much of a fan you really are. Film is one of the most culturally diverse art forms ever created, true cinephiles will appreciate it in all it's forms including Silent Film. With Halloween creeping up on us what better time to (re-)release of the most iconic horror films in cinematic history getting a rare appearance on the big screen, F.W Murnau's Nosferatu (1922). Whilst Bela Lugosi then Hammer Films romanticized that many of us perceive Dracula to be, the reclusive black cloaked fanged count who has women falling at his feet ,under his hypnotic spell, Murnau's masterpiece is film's earliest adaptation of Bram Stoker's novel seen on the big screen. Set in post world war one Germany, Nosferatu sees Knock (Alexander Grauach) a estate agent and his assistant Hutter (Gustav Von Nagenheim) go on assignment deep into the mysterious Carpathian Hills in heart of Transylvania. They arrive at Count Orlock's castle (Max Schreck)to broker the sale of Orlock home back in Germany but as the days fly past Hutter starts to notice unusual things start to happen he reverts back to the book he is reading Orlock might actually be a vampire. As the horror of realization sinks into Hutter he discover Orlock has escaped his castle back to Germany amongst a shipment of coffins leaving a trail of death in his wake forcing Hutter to Hunt the parasitic killer before a veil of death destroys his hometown. To be screened part of BFI's Gothic The Dark Heart Of Film,Nosferatu deserves its rightful place next to modern horror, frankly because of its superior quality. The film might be 9 years short of been 100 years old some may call it outdated, cliched but in reality this film's craftmanship, technical ability are second to none. This film is essential viewing for any wanna be horror filmmaker though scare factor maybe non-existent but the visual power and atmosphere stands up against any modern horror film making one of the best with the genre (possibly best within Vampire sub genre). The shadowy silhouettes, male leads exact doubles of each other, broody Gothic horror in its prime but most of all make up the symbolic German Expressionism. If there's any case for the importance of music within a feature film, the silent film era will act as your best case to support your argument. Nowdays it seem many bands fight to get a hip points however like when you talk about football matches the crowd been the '12th Man' the score is that '12th Man' providing the heartbeat of the audience delivering an extra dimension of fear, tension. 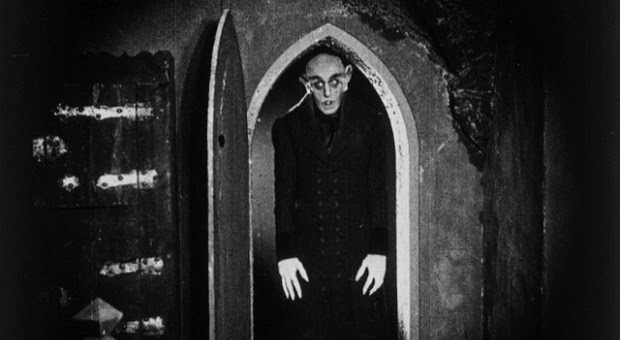 Even with a modern score Nosferatu never loses it's power still delivers the platform for Max Schreck to deliver the ultimate legendary performance as Count Orlock. Schreck's portrayal of Orlock was delivered with such conviction, terrifying passion by an actor who actually believed he was a vampire. There is no comparisons from any other actor coming close to matching Schreck,but the closest comparsions could possibly be seen in two more recent films, the highly underrated Shadow Of The Vampire (2000) and Werner Herzog's Nosferatu The Vampyre (1979) with Klaus Kinski. 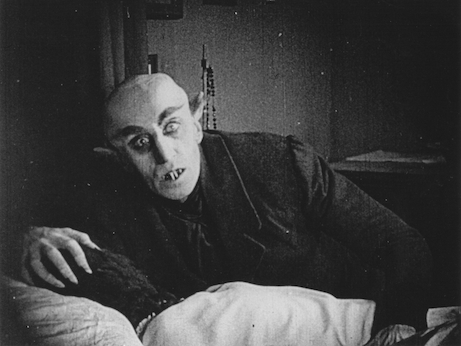 Whatever your think about Nosferatu, it may not feel part of modern romantic vision of the vampire but it has it's rightful place in horror folklore. When you look back at the story of how Murnau's masterpiece was created it makes you wonder did he know something we didn't know when he kept that single copy despite the court order to destroy all copies. Though sometimes if he had a time machine he may have thought twice about destroying the remaining if he knew that Twilight Saga lay ahead?! Whatever you think or how many versions of the film you may have on DVD or Blu-Ray F.W Murnau's Nosferatu was made for one thing, that's the big screen, don't miss a piece of cinematic gold getting a rare run on the big screen.